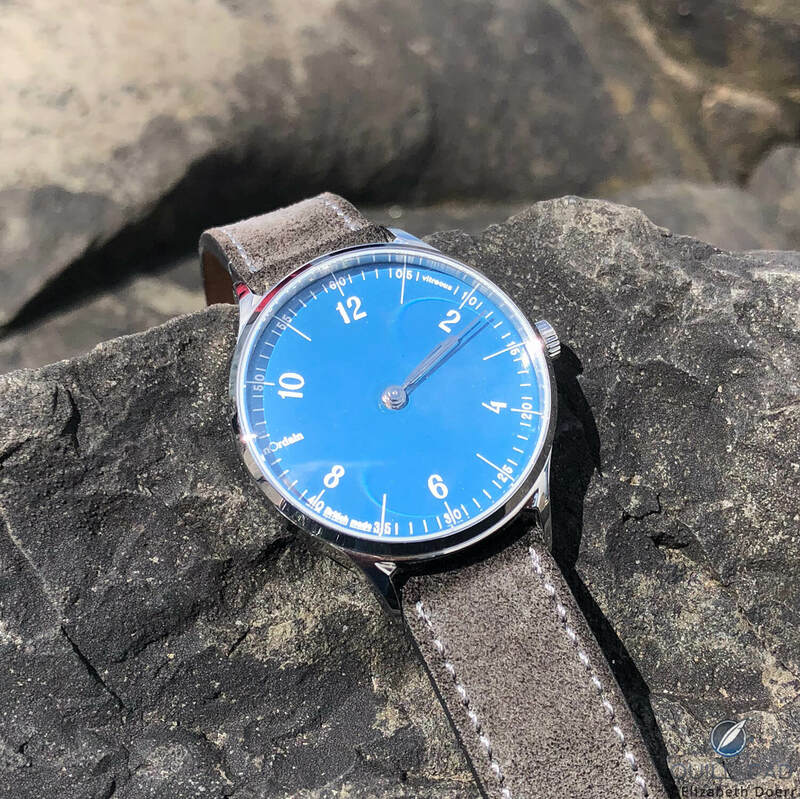 Yep, you read that correctly in the title, and that’s precisely what caught my eye as well: anOrdain, a startup “micro brand” from Glasgow offers genuine enamel dials made right in Scotland. The intriguing name of the company comes from a small, remote lochan (the Gaelic word for “small loch/lake”) called anOrdain in the Scottish Highlands. I had to investigate further to see for myself what this was all about. So I met with anOrdain product designer Lewis Heath one drizzly day in Edinburgh and borrowed a Model 1 watch for a long-term wearing test. Here’s what I discovered. “We’re a group of designers based in Glasgow,” Heath explained to me. “I’m an architect and product designer, two of us are jewelers, we have a typographer, a photographer/graphic designer, and a watchmaker.” So in other words, a band of talented allies in Glasgow figuring it out. I found Heath candid about what he and his team are doing and why. One example is how he explained to me that right around the time of the new brand’s inception, Quill & Pad published an article called Why Do Ulysse Nardin’s Dials Look So Good? Because Donzé Cadrans Authentically Fires Enamel. Using the information the team found in our article as well as its own knowledge of jewelry enamel, a few of of the anOrdain team taught themselves over the next three years how to create enamel dials. “To be perfectly honest, mastering the fundamentals of enameling has taken most of the time here; there are no books on how to enamel watch dials, and Donzé Cadrans and others don’t offer advice (laughs), so reaching the level where you’re at watchmaking tolerances and on a par with others in the industry has taken time,” Heath explained. I agree with Heath on that point: anOrdain is something quite refreshing with its handcrafted element, young design, affordability, and from what I can tell reliability. As well as a clear personal touch that is not a copy of what has gone before even though a first glance might not yet reveal that fact. The first thing you might notice after the enamel color of the dial are the numerals. These are an original font created by anOrdain’s typographer Imogen Ayres, who used British Ordnance Survey maps as inspiration for a new typeface. Interestingly, the design of the rest of the watch followed on from the shape of Ayres’ numerals, inspiring the angles and shapes of the case, hands, and other dial indexes. The distinctive hands were designed by anOrdain and manufactured by specialist producer Estima in Switzerland, but are neither faceted nor filled out with Super-LumiNova, so they are sometimes hard to read in low-light situations. The dial is quite reflective, and that is not due to a lack of antiglare coating on the sapphire crystal (quite the opposite, actually, as anOrdain applies six layer of anti-reflective coating), but rather the glossy nature of the enamel. It was the fledgling company’s jeweler and silversmith, Adam Henderson, who immersed himself in the enamel project. Henderson needed about 4,000 hours to perfect his enamel, which is applied to a copper dial blank. Henderson’s apprentice, Morna Darling, also creates enamel dials. Together they can produce about eight dials per week. The German-made suede strap that came on “my” Etruscan Blue Model 1 is good quality, light, and easy to wear with a good quality buckle. Shell Cordovan straps and Staib milanese steel bracelets are also available. The stainless steel case is also a nice design with sapphire crystal on both sides, although I found the crown a tad pokey (one of my pet peeves). I mentioned this to Heath, and he has already told me that the crown was due to be changed on the production models (my test watch was a prototype). The movement, an automatic Sellita SW200, was impeccable in its reliability. No complaints there for a watch costing £1,050. The anOrdain timepieces are assembled in the Glasgow studio by watchmaker Toby Barret, a graduate of the United Kingdom’s only independent horology degree course. My test watch came delivered in a beautiful Florentine leather travel case, which seemed almost too rich for the price to me. I was impressed by its beautiful color and quality. This watch is a good alternative to more expensive watches offering the same functionality and low-key good looks with a Swiss movement. The anOrdain looks great, wears easily, and has the added fun fact of being assembled in Scotland, a country very close to my heart (see more about why in Shrouded In Mystery And Fire: Opals In Jaquet Droz And Piaget Timepieces). I love the idea of the in-house enamel, which is stunning in its depth and variety of colors. Not to mention the idea of just digging in and teaching yourself a professional craft like that. Commendable and with a successful result! The variety of colors anOrdain offers is fun; picking one is a nightmare, though, as they are all so beautiful. The Etruscan Blue I wore is not part of the standard Model 1 palette now, but the darker Translucent Blue is. I saw one of these dials live as well, and I can only say that it is entirely captivating. This watch wears comfortably, much like one of the original four hand-wound Nomos timepieces, but a tad chunkier and slightly more noticeable with perhaps a tiny bit more wrist presence that might appeal to bigger men. This is certainly a unisex watch, though, at 38 mm: a very modern size, and one I think is the new classic size. While in numbers 12.3 mm might seem a bit high for a watch like this, rest assured it is not. It is what gives the case the wrist presence it needs to be a true unisex. Even on my (very) small wrist, this case height was fine and fully proportionate. AnOrdain offers a five-year guarantee on its watches, which is far better than the industry standard of two years and goes to show the extent to which this merry band of Brits wants to succeed in this hotly contested price class. “But do keep this in mind,” Heath somewhat seriously admonished, “this is the start, and we’ll grow more distinctive through the second and third products.” I can’t really see how much improvement is needed, but if he says so that might be worth watching out for. For more information, please visit www.anordain.com. I purchased one myself and love it. This review hits the nail on the head. Nice bunch of guys up in Glasgow doing something interesting and new in the watchmaking world and at a very reasonable price. Best of luck to them! 2015 International Chronometry Competition Now Underway, But Does Anyone Care?